Shipston-on-Stour’s 13-game unbeaten run came to an end at Midlands Three West South leaders Pinley who won 31-15. The leaders played the wet and boggy conditions very well but the Rams showed great character in the second half to fight back after a disappointing opening period left them with a lot to do. A host of uncharacteristic mistakes and poor decision making let Pinley have easy territory and possession. 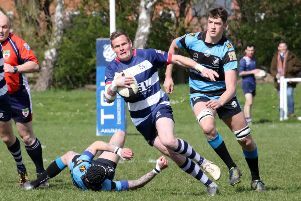 They gratefully accepted and scored three tries in the first half to open up a commanding 19-0 lead, no more than their clinical play and Shipston’s lack of accuracy deserved. Their big forwards made the most of the swampy conditions and trundled their way around the park to great effect. The Rams started much brighter in the second half and were camped inside the Pinley 22 but the home side’s defence was extremely resolute and they managed to repel the Shipston attack. To make matters worst for the Rams, Pinley were given two sniffs of the try line and took full advantage both times to establish a 31-0 lead. In the last 15 minutes Shipston brought some respectability back into the game. They scored their first try of the match through winger Harry Clark, as he finished off a length of the field effort by racing into the corner. The flowing moved was started off deep inside Shipston’s half and offered a glimpse of what this exciting young side is capable of. They followed up with a further two tries in similar fashion, throwing the ball around with great skill in the difficult conditions and perhaps more relaxed knowing that the game had gone. Their second try was scored by centre Tom Corby, as he ran a great support line and followed up his own pass to regather just metres from the line and flop over for the score. The third try was scored by Harry Jackson and capped an industrious performance from the centre. Following a fine break from Matt Daniells, the ball was recycled quickly and spun left before a scrum was awarded. Shipston won the ball and spread it wide where Jackson gathered quickly from the first ruck and dived over the line. The three tries brought the score back to 31-15 and that was how it remained until the final whistle.